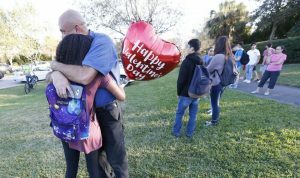 Once again, gun control or lack thereof, has shaken our nation, where on the afternoon of February 14th 2018, a gunman killed 17 individuals at Stoneman Douglas High School, Florida. A day which should have been celebrated for love and friendship, will now forever serve as a dark reminder to those who lost their loved ones to a senseless act of violence. The burning question that pops to everyones mind now is, ‘How could have such an event been avoided?’. Yet the answer isn’t simply a black and white solution. The answer needs to dig deeper into the American mindset and how the freedom(?) of gun control has led to and can continue to lead to tragic events like this. The USA has the highest population of personal firearms users and the largest proportion of deaths from firearms arise from suicides. 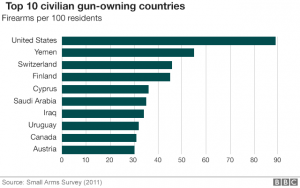 Gun control laws in the USA have led to many interesting facts arising from them. The relative ease with which firearms can be purchased by the average civilian and the surprisingly cheap cost of a personal firearms just gives people all the more reason to invoke the Second Amendment, as and when they see fit. There now exists a culture of free gun use that has been created in the minds of the people and this leads to more and more generated interest in the idea of being able to own personal weapons to defend oneself against harm. Yet the numbers only tell us the opposite. 74% of amount of incidents of violence perpetrated by civilians using firearms during the years 2010-2017 have been of the offensive nature rather than used in defense. This says a lot about the way people interpret gun laws and gun control in the United States. People no longer need good wishes and prayers. People want change. Accepting the problem is barely scratching the surface. Every day, it gets more and more difficult to propagate ideas of love and humanity after seeing such violence inflicted by human beings just like us. We need to be the change that we wish to see in the world. Each and every one of us need to take a stand for what we believe is the right thing. What we do suggest that you can do now is sign this petition, so that a move for political action on gun control can be taken. We at Communiti, aren’t politicians and we aren’t the ones to say what is best for the country. But as human beings, we know what is right and what is wrong. Helping those is need is right, and violence against others is wrong. There is no grey line here. We hope you agree and are united with us against the wrong.